As I’ve been working on the Earth Day Resources for congregations to plan actions around the 40th anniversary of Earth Day this year, I’ve been reminded of the history of Earth Day and the environmental movement in the US. The movement’s start in the late 1960s, early 1970s led to the creation of the first Earth Day, the National Environmental Policy Act, the Clean Water Act, the Clean Air Act, and the Environmental Protection Agency (EPA). Scientists warned that the pollution in the water was killing the lakes and streams; the Cuyahoga River even caught on fire. Air pollution was seriously degrading the environment. Both were impacting public health. But if I have learned anything from that movement, it was the amazing commitment of everyday people all over the country that demanded environmental improvements and made them happen. “We came to realize the human dimensions of antiseptic statistics. We came to realize that the more than 1400 pounds of air pollution per person which rides the wind and rain across this continent is a hazard to health and life and the human spirit. We came to realize that more than 50 trillion gallons of hot water, millions of tons of organic and chemical pollutants, enormous amounts of fertilizers, pesticides, and most of all, sewage every year are spoiling rivers once celebrated in our art and literature and history. The Hudson and the Potomac, the Missouri and the Monongehela, the Snake and the Androscoggin – all rivers rich in history – are today rivers rich in industrial and municipal wastes. We came to realize that the more than 7 million automobiles, 20 million tons of paper, 48 billion cans and 26 billion bottles a year which litter our landscape means that almost nowhere on this continent can man escape the impact he has had on nature. 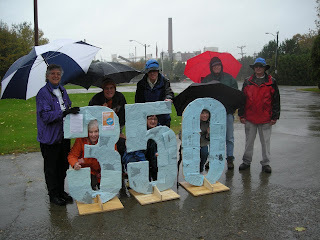 Now is that time for climate change. In December 2009, the EPA announced an endangerment finding, allowing EPA regulation of greenhouse gas emissions under the Clean Air Act. On January 21st, Senator Lisa Murkowski (R-Alaska) introduced a disapproval resolution, which is expected to be brought to the Senate floor sometime this month. If passed, it would block the EPA from regulating greenhouse gases and dirty coal, and furthering US contributions to the environmental injustices that contribute to climate change. Supporting the Clean Air Act is the best way we already have under current law to limit the environmental justice impacts of climate change and to help our country shift to a clean energy economy. This is, without a doubt, the way of the future. Please contact your Senators and tell them to support the Clean Air Act. This is only the first step. Together, we can, and must, work towards a world where the environment is healthy for all who live there. The people who receive the least of society’s benefits and have the least power to affect changes are the ones who feel the environmental impacts first and most severely. Climate change is already being witnessed by people who work closely with the land. Together, we must love urgently and work towards climate justice. 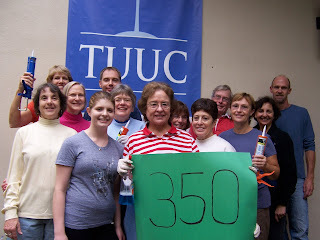 What food choices can Unitarian Universalists make to build a planet that is both sustainable and just? If you walk into an average supermarket these days, you’ll find thousands of choices of things to eat. Some things may be grown or produced in low-impact ways at a nearby farm, but chances are that many items for sale contain ingredients whose production has negatively impacted the Earth and her people. 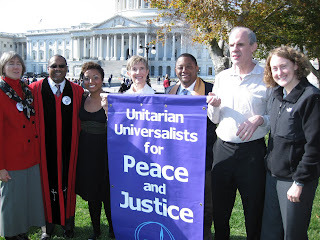 As Unitarian Universalists, we are committed to living in ways that respect the inherent worth and dignity of all people as well as the interdependent web of life of which we are a part. With so many choices, how can we find ways to eat ethically? Fortunately, people all over the United States are thinking about just this right now. Several best-selling books have been written about authors’ deliberations about what to eat, and UU congregations have been engaging in the current Congregational Study/Action Issue, “Ethical Eating: Food and Environmental Justice.” For the 40th anniversary of Earth Day this year, the UU Ministry For Earth (UUMFE) is asking members of all congregations to think about what they eat and what food choices are available to those in their communities. While Earth Day isn’t until Thursday, April 22nd, resources for planning your Earth Day events are already available on the UUMFE website to help you plan both worship and social justice projects. Check them out! On the eve of the final day of the Climate Negotiations in Copenhagen, I share with you some reflections from Unitarian Universalist Pam Sparr on significant events from the first week and on what the religious community can do. I attended the first week of the COP-15 events in a professional capacity as a consultant with another religious organization and have just returned home. As I read accounts of what is happening in week #2, I think my reflections on that first intense week of activities still hold. Here are some of my impressions…. The rock concert-like climate justice rally in Town Hall Square with the ever-charismatic Archbishop Desmond Tutu. This was the most upbeat of all events I attended. He presented more than a half million signatures from people in two dozen nations (including the U.S.) to the head of the UNFCCC – the man whose job it is to keep the negotiations going. These signatures supported a strong binding agreement. This was a wonderful example of how the religious community can use its moral authority well. It was also a reminder of how well respected and beloved a religious leader can be – even by people who do not consider themselves “religious” – if they are courageous in their faith and take a public stance on justice issues. The international ecumenical worship service in Copenhagen’s Lutheran cathedral where religious leaders from around the world processed in with poignant, silent symbols of the destruction climate change is already wreaking – bleached coral from the Pacific, shriveled cobs of maize from Africa, stones laid bare from the melting of glaciers in Greenland. A reminder that ritual can be very powerful. The demonstration last Saturday with 100,000 people in the streets all concerned over the lack of progress in reaching a strong, just, and binding international agreement – the largest such gathering to date on this issue. A peaceful show of concern and an unexpectedly large size group which the Danish police didn’t know how to handle well. A seminar on the rights of Mother Earth sponsored by the Government of Bolivia – an example of how smaller nations are finding their voice and political strength in interesting ways with respect to climate change. This is also one of the cutting-edge initiatives that UUs interested in rights-based or Earth-care advocacy should investigate. Two official US government briefings for non-governmental organizations, where, by luck, and possibly by virtue of wearing a highly visible red turtleneck sweater, I had the privilege of asking the first question of the week to our #1 negotiator. While I am not a regular at major international meetings, I have participated in several historic conferences, including the infamous World Trade Organization ministerial in Seattle. The increasing frustration expressed by delegates from Southern nations in Copenhagen, including tears, tempers flying and threatened walk-outs seems to be much higher here than at any of the other meetings I have attended in the past 17 years. While some of this may be posturing, my sense is that most of the anguish is a legitimate reaction to the fact that the U.S. and other wealthy countries are dragging their feet while the clock is ticking. On the one hand, this first week showed signs that the South is holding together and taking a stronger stand. For me, this was one of the few beams of hope in the proceedings. On the other, the lack of progress left me gloomy about prospects on the official level. I am most immediately concerned that we have a long way to go before we get international agreement to set a sufficiently strong, binding target to limit greenhouse gas emissions. At this time, the U.S. government is not willing to do what we must to meet our moral and legal responsibilities in this regard. Our government is the biggest stumbling block at this time. There are several policy components to this emissions cap hurdle. The most pressing one now concerns targets for 2020. We need to cut emissions dramatically and fast if we are to have a good chance of preventing a dangerous tipping point – and averting tremendous suffering and hardship on the part of people living in poverty in developing countries. We have a very intelligent, skillful negotiating team representing the U.S. I would not want to sit across from them at the table in Copenhagen. From my personal advocacy experience, I have come to see more clearly the limits of intellectual engagement with our officials, and even limits to moral or ethical arguments. In a few areas, I have seen humanitarian and faith-based NGOs make a positive impact on the U.S. position on international climate change policy. In those cases, it is apparent that the more technical knowledge one has and the more organizing resources you have, the more effective the organization can be. Certainly, most NGOs were using a combination of political organizing and intellectual engagement – an “inside” the Bella Center [formal location for the meetings] and an “outside” strategy. Some faith-based groups were using both strategies while others felt an inside strategy was useless. By the end of the week, I was feeling like the most productive contribution the U.S. religious community could make would be to try to break through to an emotional and spiritual plane with our negotiators in some form of public witness. This is the realm where the religious community has particular expertise and responsibility. Eco-psychologist Bill Plotkin describes our nation as in an adolescent stage of emotional and spiritual development. This felt true for the U.S. position in Copenhagen, despite the sophisticated economic and political rationale for the official stance. Most of us in the U.S. are comfortable in our privileges and ignorant of the consequences our policies and lifestyles have on the lives of people living in poverty in developing nations. As a nation, we are addicted to fossil fuels, privilege and power. The world sees us as digging in our heels to defend “The American Dream” which is a dream only for some in the U.S. and increasingly becoming a nightmare for many others around the globe. In his sermon in Copenhagen, the Archbishop of Canterbury reflected that government negotiators from the North and South were operating out of fear. Some of that fear is rational and some of it is not selfish. Nonetheless, he urged the negotiators to detach from the fear and forge an agreement out of love. Certainly this is the mandate for the U.S. religious community — to shift public attitudes and re-set the tone of Congressional debate on climate change policy. This is a long-term challenge that will remain with us well after the conference ends. UUs have practiced Standing on the Side of Love before. Now we must do it again. Lynn Dash, UU-UNO Special Correspondent, has shared more notes with us from her experiences at the Copenhagen Climate Conference. These notes are from side events she attended on Thursday, 12/10, and illustrate both the ways that youth are affected by climate change and what they’re already doing to take action. Youth have an incredible stake in the negotiations going on right now. Today I attended two “side events” organized by youth (defined as those under 25). Both had a sea of bright orange T-shirts, printed in front with “ How old will YOU be in 2050?” and on the back with “Don’t bracket our future.” Today I learned there are about 2000 youth here. Like the CAN—Climate Action Network—they are asking for an agreement that is FAIR—AMBITIOUS—BINDING. Yes, this sounds pretty elementary but it is very complicated, deciding on “Differentiated responsibility,” whether carbon off-sets should be counted, and a myriad of other technical details. The youth point out that in the end, it is their lives that are being affected more than the present negotiators. In the workshop “Youth and Student Movements Leading the Way,” we heard about use of social networking technology to bring youth together from all over the world. They are reaching out to younger students, inspiring local actions, and creating innovative energy-saving devices. They are promoting intergenerational and inter-institutional cooperation. They are presenting their concerns to the powers that be in their towns, countries, and at the UN. Their careful study results in articulate presentations whether to peers, at a plenary session here with thousands of observers, or at a special briefing. Two young women, one from San Francisco and one from India, joined the environmental writer Bill McKibben to co-found the 350.org movement. Scientists say we need to reduce our greenhouse gases to 350 parts per million from our present 389 ppm to maintain our environment as we know it. Another workshop focused on “Intergenerational Equity” and noted the growing number of young people around the world who are working on climate change. I am bringing back a little book entitled Climate Legacy Initiative: A New Legal Perspective on an Unprecedented Crisis, by one of the speakers, Tracy Bach from Vermont Law School. The responsibility the older generations have, to pass on a world as intact as the one they received, may be codified into law in some ways, but we know it is already a moral and ethical obligation. This reflects the wisdom of the Iroquois Nation Seventh Generation—whatever we do, let us think how it will affect our progeny unto the seventh generation. A lot has happened this past month on climate change. The Kerry-Boxer Bill (Clean Energy Jobs and American Power Act of 2009) was voted out of the Environment and Public Works committee. Senators Kerry, Graham, and Lieberman started a tri-partisan “dual track” of negotiations on a climate bill, working with the White House to craft legislation that would be likely to get the necessary 60 votes. President Obama agreed to attend the United Nations Climate Change Conference in Copenhagen, which many of us and our allies have been and announced that he will negotiate to reduce US global warming emissions “in the range of 17%” by 2020. We need stronger climate action to really protect our planet and prevent further climate catastrophes from happening. With the start of the United Nations Climate Change Conference next Monday, December 7th, we’ll all have to keep tuned to the direction the climate talks go. A number of UUs will be in Copenhagen and may contribute to this blog while they are there. In other news, information on the Dial Down Climate Change campaign should be on the Climate Change pages of the UUA website soon and the Unitarian Universalist Ministry for Earth website has information about other ways of getting involved. Today is the annual Blog Action Day, with the intention of creating discussion. More than 8500 blogs in 148 countries are committed to discussing climate change today. With that many voices discussing this issue at this critical time, there’s a lot of opportunity to raise energy and participate in actions. There’s only 52 days left until the United National Climate Change Conference in Copenhagen to make an international treaty on Climate Change. The International Day of Climate Action is in just 9 days, on October 24th, and people will be doing actions worldwide to draw attention to the importance of lowering the parts per million (ppm) of Carbon Dioxide in the atmosphere to 350 ppm. Right now, Senators Boxer and Kerry have introduced the Clean Energy Jobs and American Power Act in the Senate. There’s a little less than two weeks before the intensive legislative hearings are expected to begin, on October 27th, which means that right now there’s a window of opportunity to shape the bill in the directions we want. In other words, we’re at a pivotal time in the environmental movement. There are opportunities at the national and the international level to shape the climate change debate; it’s an opportunity to have governmental support in the direction of justice through climate action. The most marginalized communities are the first to feel the impacts of climate change, and if we wait until the wealthier nations are directly affected, it will be too late. I invite you to join the conversations today and blog about Climate Change. Our ally 1Sky has ideas for what to write about if you’re feeling stuck. You can register your blog on the Blog Action Day website. And then next week, participate in the International Day of Climate Action. The UU Ministry for Earth has resources available on their website, and a list of what UU congregations are doing for the event is forthcoming. This morning during Theological Reflection, we focused in on the problem of environmental (in)justice, the source of the problem, solutions, and sources of those solutions. Our separation from the natural world on which we depend can make it really challenging to truly understand our impact on the planet and the people involved. When eating a bowl of cereal, how many people really think about the people who planted and harvested the ingredients, who made those specific varieties, who stored them, who built the storage facilities, who made the trucks and roads, machinery and cars, all the way down to the person who stocked the shelves of the supermarket before they bought the box of cereal? Not to mention the environmental impacts of the particular kinds of grains grown and the growing methods, the kinds of fuel used to make all of this happen, and their impacts on the environment as well as the people living and working in those communities. And we haven’t even gotten to the milk, the bowl, or the spoon! Our ability to eat a bowl of cereal only comes to light with the hard work of people all over–we are not entitled to even such everyday things. Environmental and environmental justice issues surround us, and the scale and complexity of these problems is only magnified with globalization. Every person in this tale of cereal, and all the un-named folks as well, have the same inherent worth and dignity, and our future is tightly interwoven. We need to hold ourselves accountable for working towards environmental justice. One thing we can do is to follow through with the actions to which we commit. At the 2009 UUA General Assembly, delegates voted to Support America’s Red Rock Wilderness Act as an Action of Immediate Witness. For ideas and assistance in taking action to see this through, visit the Southern Utah Wilderness Alliance website.